My Kids Stole My Brain: Where were you? 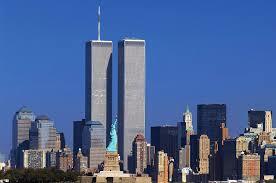 September 11, 2001 I was at work, at FOX13 in Tampa, Florida, in our morning meeting. That’s where we discussed the news of the day & pitched story ideas for our shows. Little did we know, that morning meeting would act as a portal between the old world we loved...and a new world we knew nothing about and quite frankly wished we didn't. 17 years ago, we would walk out of that meeting, many of us in tears, into a world that would NEVER BE THE SAME. So eerie to think of that now...I have chills just writing this. Moments after the first plane hit, someone came to tell us what happened, and you could sense the worry in the room. But still, we had no idea what was really going on. We immediately turned on the big TV in the conference room and sat speechless, glued to the screen. Next, we started blurting out possible scenarios and questioning how in the world a plane could ACCIDENTALLY fly into such a big building?! Obviously, it didn't add up. Keep in mind, 17 years ago cell phones were still in their infancy, so we weren't being bombarded with information from the scene, quite the opposite. Everyone was in shock and clueless as to what was unfolding. All we could do was sit and stare at that TV. That’s when it happened. As we were trying to comprehend what was going on, out of nowhere, ANOTHER plane came racing through the sky and flew right into the second tower. We all gasped in horror! We couldn’t believe what we were witnessing. We were under attack. ATTACK! Someone said terrorists. I had no idea what they meant. From there we all went into auto-pilot, doing what one does in a newsroom during a breaking news story...THE BREAKING NEWS STORY OF A LIFETIME. Being a news producer we are exposed to every bit of video and audio available. This can be a good thing, and as it turns out, a very bad thing. I spent hours that day and the days and weeks that followed watching and listening to words and video that I couldn't really process. At times, I would completely break down, sobbing while listening to the final phone messages victims left for their loved ones. I watched people jumping from the buildings (someone's husband, wife, sister, brother, son, daughter) and then videos of some of them hitting the ground...the sights and sounds still haunt me. Those of us who lived through it will always remember where we were when the world changed. 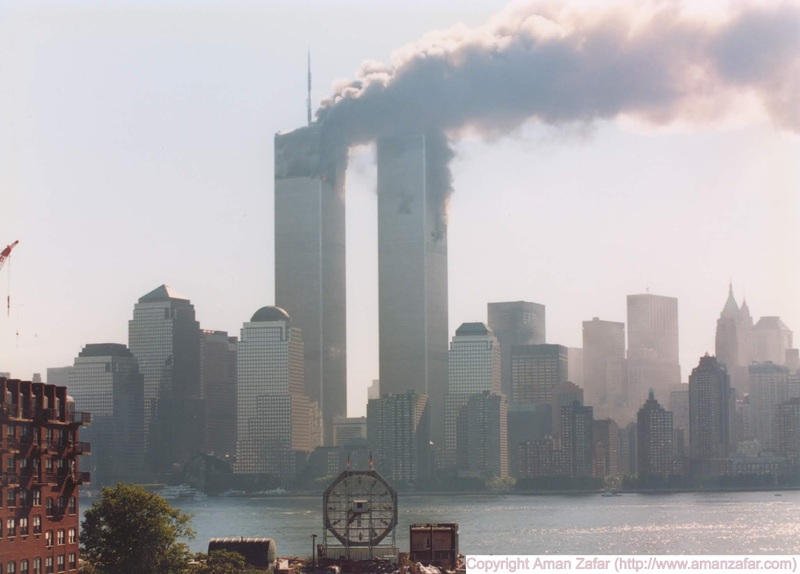 I was at work in NJ, 13 miles away from NYC, on the morning of September 11, 2001. It was a beautiful day, all blue skies and no clouds in sight. I got to work right as the first plane hit the tower and I remember watching the TV being confused. How did that happen? What type of plane was it? Was it a little private plane? Just a few months back I had flown up the Hudson River on a little 2-seater Cessna with a friend, marveling at the buildings and how close we were to them. Surely someone just misjudged that same route? Then the reports came in...it was in fact a commercial plane. How did that happen? All I could think was "who do I know that works in those towers?" I had lots of friends who worked in the financial center, but I didn't know where. Panic. I tried to get in touch with people, to no avail. Then the phone rang and a guy from London who I had met in Vegas in May, 2001, sounded panicked. He was on the phone with Joey and Mike when the plane hit, he heard screaming, then the line was dead. Joey and Mike worked at Cantor Fitzgerald; we found out later they were in fact on the 105th floor. Then before I could catch my breath, the second plane hit. More confusion. "Terrorists" the reporters said. I couldn't quite grasp what was going on. My co-workers and I gathered in my office to do the only thing that seemed to make sense - we bowed our heads and prayed out loud. 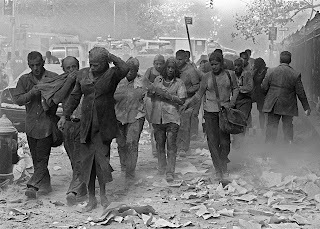 We begged God to put a stop to the evil that was happening, to stop the terrorists, to protect the people in the towers, to be with those who seemed trapped. Then the tower fell...and then the next...and the plane in Pennsylvania...it was too much to grasp, too much. I couldn't work, I couldn't think, so I decided to go home, to see if I could help in any way. It took me over 2 hours to go the 13 miles to Hoboken; the Lincoln Tunnel and the roads leading to it were all closed (thus making my route very circuitous; I followed cars that I were hoping were going to Hoboken since there was no GPS on phones back then). When I got home I immediately went to the top of my apartment building to where the skyline was no longer the same. 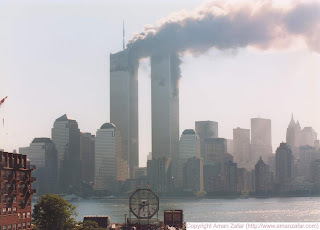 The towers were gone and in their place smoke. While I knew what to expect, I cannot explain what it felt like. It was surreal. There was no fire, but LOTS of smoke. It was still sunny, making the smoke stand out even more. I wish there were smart phones back then, so I could have captured those images. These huge buildings that defined the southern tip of NYC simply GONE. Forever. The loss of life seemed unimaginable. I had to help. I took off to a local Catholic Church; they were expecting injured and people just escaping the city to come via ferry to Hoboken. Surely they would need our help? We didn't really know how to prepare so we're started sorting clothes. But after an hour or so it was obvious that no one was coming. The injured had gone elsewhere and as we feared, many had perished. So I went to Frank Sinatra park, a newer park in the south eastern corner of Hoboken that faced the Twin Towers. There were hundreds of people, standing in silence. Staring. Holding lit candles. Praying. The wax from those candles remained on the brick pavers for years after. It was a reminder of all that was lost that day. It took me until 3pm that day to get word from all my friends that they were safe. PRAISE GOD! I could not believe how lucky it was that everyone I knew escaped either the towers or neighboring buildings. Many didn't even work down there, even though they were in finance. I felt so unbelievably lucky, but I knew how many people were not. How many families were in those very moments, getting news they never expected to get. I was still worried that people I was used to seeing out at bars that I may not have been friendly enough to have their cell phones, but whom I would talk to several times a week nonetheless, would just be...missing. I dreaded going out. 07030 was the zip code that lost the most lives that day. Hoboken. My home, a place I will always love, a place that will hold the memories of that tragic day for me. Everyone I knew ended up being accounted for. Again, I felt beyond lucky. My roommate wasn't as lucky. Her college friend was a flight attendant on the flight from Boston; I believe it was the second plane to hit. She also lost two other friends in the towers. On Sunday, September 16, I went into the city to go to church, just as I normally did. I had to go, and I wasn't scared. But I certainly was sad. The city was an absolute ghost town. Armed guards and policemen with ARs were everywhere. I said "hi," I thanked them for their service and apologized for the loss of their brothers. Words were not enough. There was a sadness that remained in the background for a VERY long time. I remember coming down here (to Florida) for Thanksgiving and Christmas, and it was if nothing was different; it was so odd! I came from a world where the difference was palpable. The losses were great. People were connected like they had never been before. I don't know how to explain it, or put it into words. You will have to just trust me when I say that being from up there was SO different than being from anywhere else. It just was. Maybe it was because everybody was affected. Everyone knew someone who didn't make it home that day. Everyone knew people who escaped the towers and/or the general vicinity. I heard stories of how friends were walking down the stairs of the tower when people tell them to go back up, but they didn't listen. A friend swears a Bible saved her life when she used to to shield her head from items falling from the sky. Stories that didn't come from the TV. I will certainly never forget.